It’s a little embarrassing to admit that Standing Room Only’s The Fantasticks is the first time I’ve seen the show. Every musical theatre fan worth their salt has seen many different productions, right? I’ve had the 1960 original off-Broadway cast album for a long time, and many of the songs I know well because of cover versions performed by Barbra Streisand and Robert Goulet, and I did see the terribly misguided and unfortunate film version. Perhaps it’s fitting that my first time seeing this classic is in this quite adorable, well-sung production playing at the Shedd Theatre within the Columbus Performing Arts Center on Franklin, where most of my most enjoyable local theatre experiences have occurred over the past two years. 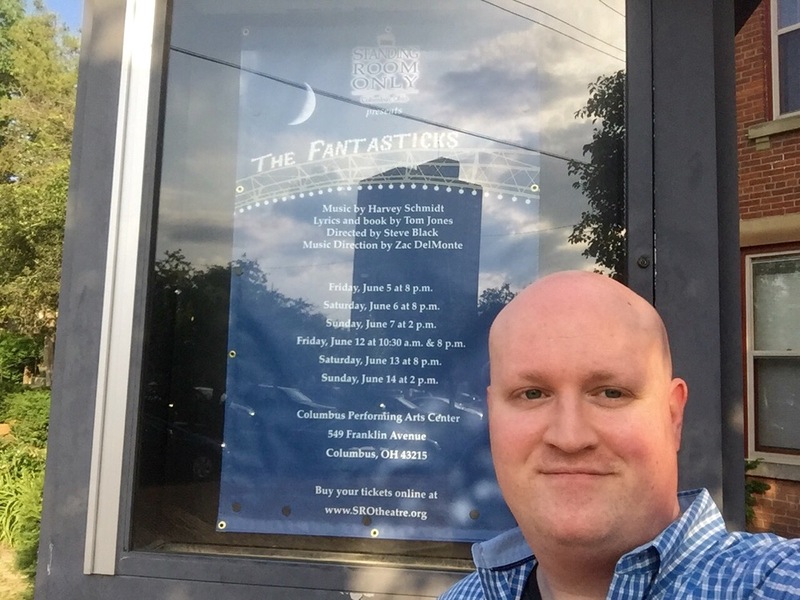 The Fantasticks has a classic score with music by Harvey Schmidt and book and lyrics by Tom Jones (not the Vegas performer), and it ran continuously for over forty years off-Broadway while also being licensed for production all over the world. It is about two young neighbors named Luisa (Sharon Kibe) and Matt (Lake Wilburn) and the efforts of their respective fathers Bellomy (Scott Wilson) and Hucklebee (Ron Nocks) to make them a couple. The fathers pretend to hate each other in the hope that their children will rebel and fall for each other. They enlist El Gallo (Chris Rusen) to help them stage an abduction to bring the youngsters together, though they were already smitten and needed no assistance. The deception is unveiled, the lovebirds part, but everything turns out in the end. The plot isn’t going to keep anyone on the edge of their seat, but it doesn’t need to – the joy is seeing the show play out simply and engagingly, and Steve Black’s direction does just that. The Fantasticks is designed to be performed on a minimal set with practical curtains and effects, which is the case here, but this production also has more sophisticated lighting cues and clearer sound than I expected. Aside from some loud but brief distortion (it sounded like a mic was live on a cast member while they were going through a costume change or an arm was brushing up against a body mic), the sound was remarkably clear and well modulated. The lovely piano accompaniment by Aaron Dvorak didn’t overpower the performers nor did they overpower it, a difficult balance to maintain I’m sure. There was a strange anomaly where Lake, whenever he faced away from the audience and towards Sharon, sounded like his voice was coming exclusively from a speaker on the far left. It was unintentionally funny when during “Metaphor” his voice would shift from coming from the center to far left to center to far left and back again as his head turned out towards and then away from the audience. Still, he sounded quite clear. Though I saw the first performance, everyone appeared on pointe and ready to play, aside from a few negligible slip ups by fifty-year stage vet Ron Nocks (Hucklebee), who gets a pass considering how affable he comes across in a rather age-inappropriate role. As his son Matt, Lake Wilburn is startlingly good; handsome, appealing, bold-voiced without suffering from American Idol-itis, and the very definition of boy next door, which he is in this play. Sharon Kibe plays Luisa as more coquette than feline though the script would allow for more of the latter. She doesn’t appear to need to breathe much to be able to race in preparation to move from chest to head voice, and there were times I thought she sounded more Christine Daae than a simple farm girl, but she still was present and in the moment. Someone needs to dial her down from an 11 to a 7 or 8 though as she often opens her eyes so wide that they cross. Less is more, Sharon, so being young and cute while having Lake to play against can do some of the work for you. Scott Wilson as her father makes me mourn the performance I missed of him as the governor in The Best Little Whorehouse in Texas several years back. He is jolly with a pleasing timbre to his voice, but he is skilled in reigning it in during his duets with Ron Nocks so that they both can be heard. Chris Rusen as El Gallo reminded me of Puss ‘n Boots, but that isn’t a bad thing. His gaze is strong and focused, and he has the looks and manner to be just as appealing but in a wholly different way than Lake. Sharon is a lucky girl, so maybe that’s why she comes off as a tad over excited. They all sing well, and isn’t that the most important thing anyway? I was shocked to read in the program that Henry, one of El Gallo’s sidekicks, is Sileye Ndongo, a high school senior! Sure, he’s playing the part of an old man and he has a lot of affectation and stage presence, but a high school senior? Lake is also a senior, but he is playing someone around the same age. Sileye dives into near senility and wiriness fearlessly, playing someone easily more than thrice his age. Wow – his scenes with fellow sidekick David Johnson (Mortimer) are laugh out loud funny. Special attention should also be paid to Alex Lanier as The Mute, who gets the first laugh in the show and starts off the evening before settling into the scenery. I liked looking at her face from time to time as she watched her cast mates perform, seeming to enjoy the show as much as the audience while still staying in character, with only her eyes going her away. It can’t be an easy part, but Alex made her mark in it. Director Steve Black keeps the show moving, and though his bio lists his long history with the show his direction never comes off as rote or just functional. I found myself a bit startled when it ended as I was in the wonderful position of wanting more because of how sweet and delightful the performance had been. It wasn’t perfect, but it wouldn’t have been half as enjoyable if it was. It’s a very good presentation of a classic and feels fresh.